This Halloumi Sandwich is stuffed with salty cheese, fresh spinach and a zesty Avocado, Pea and Mint Pesto. It’s fully loaded making it a meal in itself. At some point in the last year (I forget when) my lovely friends Dan and Beth came to ours for dinner. It was mid-week and I was working quite long hours at the time so Beth kindly offered to do the honours and prepare dinner for me! I came home to wonderful smells in my flat and the sound of laughter as Dan, Beth and Jon all chatted over a couple of beers. You see we don’t get to see Dan and Beth very often. Dan is a very old school friend of mine and Jon’s and last year he married Beth a wonderful woman he met whilst working in South Sudan. Beth is from the US and they now both work in Egypt so it’s a bit tricky finding the time to see them when they do come back to the UK for brief visits. But when Dan and Beth do come back they always bring good stories and good food! The Americans love a good sandwich, and they know how to do them properly, not compromising on flavour or size. Too many fillings? No such thing! These are the kind of sandwiches I love. Deli style sandwiches piled high with tasty fillings, dripping with sauces and condiments, a meal in themselves. It was Beth who introduced me to this jam-packed American style halloumi sandwich. 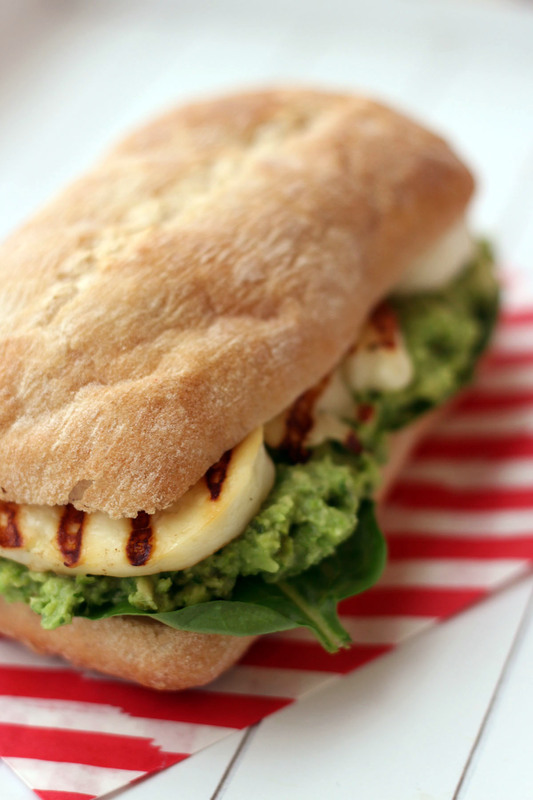 Along with a deli style ciabatta roll, the sandwich is built with a layer of fresh spinach leaves, salty halloumi and a zesty pesto made from avocado, peas and mint. OK…so it’s not strictly a pesto but it adds a fantastic, soft silky texture to the sandwich and brings a fresh vibrant flavour which makes this sandwich anything but boring. Although there are a fair few ingredients in this sandwich it’s still pretty quick to make. Just chuck the pesto ingredients into a food processor and it’ll be done in next to no time. Griddling the halloumi is optional but there’s nothing better than a warm slice of halloumi with crisp griddle marks. I also love the contrast of hot and cold in a sandwich. If using fresh rather than frozen peas, fill a small pan with boiling water and cook until the peas are soft. Place the peas, avocado, lemon juice and mint into a food processor and pulse until a course paste has formed. Slice the halloumi into roughly 6 pieces and griddle on a high heat for 3 minutes on each side or until golden griddle marks appear. Slice each ciabatta and make a layer of spinach leaves followed by half of the pesto, finally top with half of the halloumi. Enjoy while the halloumi is still warm! Can you see why I’m willing to momentarily give up my hatred of sandwiches for this tasty meal? I’m secretly hoping next time we see Dan and Beth, in whichever continent that may be, that we get to have more of her delicious food! I love it when new ideas for dishes and dinners come from friends and family. After all food is made to be shared! I WANT one of these really badly now. I love sandwiches, but not the horrible things you find in supermarkets. You need good bread to make a good sandwich as well as tasty fillings and this one sounds stupendous. Would love to have heard some of the stories from Egypt too. Thanks for linking to my avocado and egg filling. Hi Choclette. Couldn’t agree with you more. Unfortunately we’ve not seen them since they moved into their flat on Cairo. I’m sure the have lots of stories to share! Wow! This sandwich looks amazing and it fortifies my love of halloumi! Great photos! Love the red striped napkin too! Thanks Lia! I’m also a big big fan of halloumi! Any excuse to eat it and I’m there. You’ve only just started liking avocado? I adore the stuff…though not in a clean eating, avocado mousse kinda way hahaha. You should definitely try this, I’d love to see pics. That looks lush! I love halloumi, and the pesto sounds delicious too. Mmmmm. 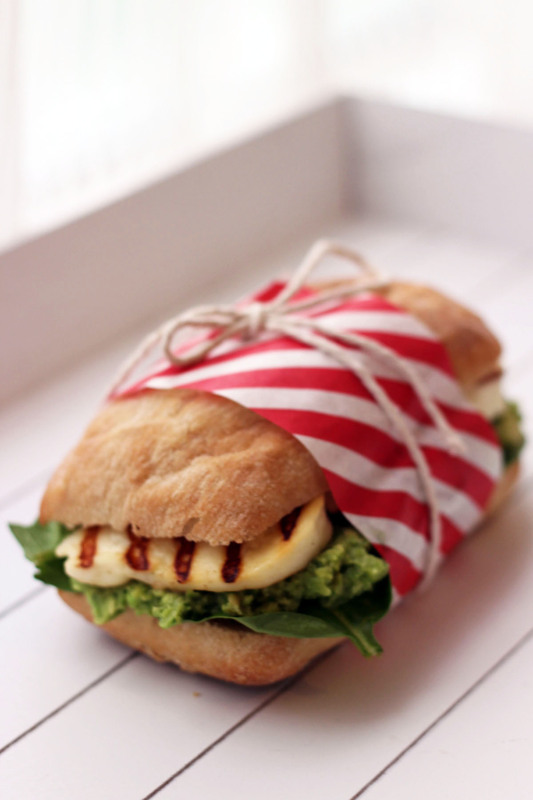 Looks stunning – love halloumi and your stripy paper and string are so cute. Thanks for linking to my post too!